Stocks are higher this morning after the Turkish Lira rallied 6%. Bonds and MBS are flat. Import prices were flat in July but were up just under 5% on a YOY basis. This was pretty much all driven by oil prices which are inherently volatile and self-correcting. Small business optimism is near record highs according to the NFIB. Availability of workers remains a big concern, and we are seeing record levels of compensation increases. Note that many of these comp increases are planned, so there will be a 9 month lag before it shows up in the government data. Credit availability is a non-problem. The biggest headache for small business is availability / quality of labor, not the cost of labor. I don’t know that we have cost-push labor inflation quite yet, but if that is the case, then it won’t be good for mortgage rates as it will primarily affect the long end of the curve. HUD is electing to discontinue the Obama Administration’s controversial interpretation of the AFFH rule from the 60s, which means it no longer will be suing towns to force them to change their zoning codes to allow multi-family housing. HUD will focus on eliminating regulatory impediments to building more housing, and will tie grants to measures which increase building. In other words, The Obama Admin used a stick approach, while the Trump Admin will use a carrot approach. Home prices rose 0.7% MOM and 6.8% YOY in June according to CoreLogic. They are forecast to rise 5% over the next year. Sales in the red-hot markets are down double digits as affordability issues and lack of inventory crimp activity. The Despot reported better than expected earnings as homeowners choose to fix up their existing place instead of trying to move in a tight real estate market. Better weather helped the company rebound from their sales miss in the first quarter. Stocks are lower this morning after North Korea pushed back on the proposal to end their nuke program. Bonds and MBS are higher after the the 10 year decisively pushed through the 3% level yesterday. The 10 year hit 3.10% yesterday on no real news. If the inflation numbers aren’t all that bad, why are rates increasing? Supply. The government will need to issue about $650 billion in Treasuries this year compared to $420 billion last year. Note that one of the downsides of protectionism will be seen here – when the US buys imports from China, they usually take Treasuries in return. Less trade means less demand for paper. Rising rates may present problems for active money managers. The average tenure is 8 years, so this is the first tightening cycle they have ever seen. For the past decade, cash and short term debt have not been any sort of competition for stocks and long term bonds. Note that the 1 year Treasury finally passed the dividend yield on the S&P 500. Stocks and bonds are going to see money managers allocate more to short term debt. Despite rising rates, financial conditions continue to ease. The Chicago Fed National Financial Conditions Index is back to pre-crisis levels. 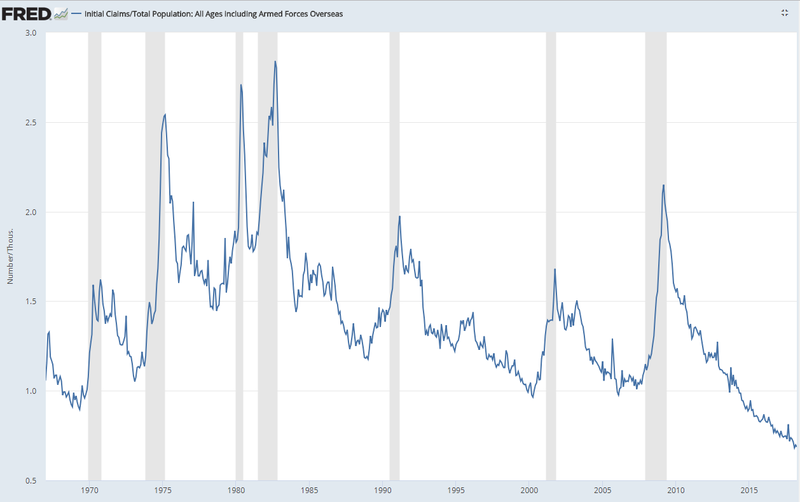 Note that doesn’t necessarily mean we are set up for another Great Recession – the index can stay at these levels for a long time, and we don’t have a residential real estate bubble. That said, this index can be one of those canaries in a coal mine for investors – at least selling when it goes from negative to positive. Mortgage Applications fell 2.7% last week as purchases fell 2% and refis fell 4%. The refi index is at the lowest level in almost 10 years, and the refi share of mortgage origination is at 36%. The typical conforming rate fell a basis point to 4.76%. April Housing starts came in at 1.29 million, down 4% MOM but up 11% YOY. The Street was looking for 1.32 million. Building Permits 1.35 million which was right in line with estimates. Multi-family was the weak spot. Note that March’s numbers were unusually strong (relative to recent history), so April was a bit of a give-back. Industrial production rose 0.7% last month while manufacturing production rose 0.5%. Capacity Utilization rose to 78%. New York State is suing HUD to force them to continue to use the Obama-era standard of enforcing AFFH. HUD delayed the rule after numerous local governments were unable to implement policies in time. Andrew Cuomo’s statement: “As a former HUD Secretary, it is unconscionable to me that the agency entrusted to protect against housing discrimination is abdicating its responsibility, and New York will not stand by and allow the federal government to undo decades of progress in housing rights,” Cuomo said in a statement. “The right to rent or buy housing free from discrimination is fundamental under the law, and we must do everything in our power to protect those rights and fight segregation in our communities.” Of course overt housing discrimination hasn’t existed for half a century, but that isn’t what this is about. The issue is zoning ordinances and multi-fam construction. Expect to see more of this sort of thing in blue states as the housing shortage gets worse.